The team left Skyline at 6 Sunday night, and arrived in Pittsburg around 11 p.m. Seniors Brooke Fisher and Ascha Lee, juniors Austin Gilpin, Blake Lee and Landon Lee, and sophomore Colin Kumberg attended the event. Kumberg said that they went up early because of bad weather conditions and a forecast for snow the next day. Regionals started at 4:30 in the afternoon on Monday. “We won our first match and then lost the next four in a row,” Landon said. “We did pretty well, but we’re still not ready for higher level competition.” The team won their first match with a tiebreaker question. Landon said that to do better, they needed to answer more questions and work on the areas of math and fine arts. They also got to swim in the hotel and go to the mall before the meet started. There were some worries about having to stay another night because of the weather, but the team was able to make it back on Monday night. “We were afraid that we would have to stay another night because we didn’t know how much school we would miss and how far behind we’d get,” Landon said. Kumberg said that they were also concerned about not making it back in time for the basketball game against Attica on Tuesday night. Most of the varsity team will have another chance to do better next year, with four varsity quizzers returning. 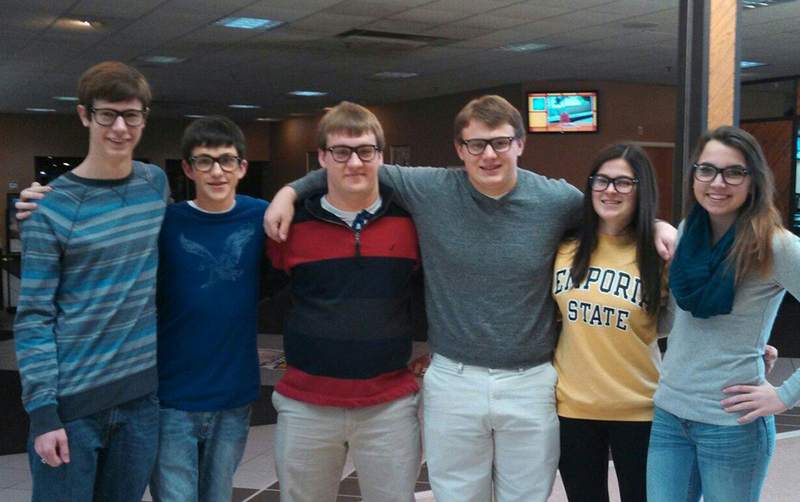 “It’s a really short season, but Scholars’ Bowl is one of the better things about winter,” Landon said.